Opossums are common in both rural and urban backyards. For some, they're pests; but these wild neighbors are important members of the ecosystem, eating bugs, overripe fruit and sometimes even mice. Opossums usually aren't domesticated, but keeping them as pets is not unheard of. Is this nocturnal animal a possum or an opossum? Possums and opossums are different animals from distant parts of the world. Possums include a variety of species native to Australia and the Pacific Islands. About 70 species of possums inhabit the South Pacific, including koalas and wombats. Opossums are New World critters. They're conversationally called "possums" in the United States and other countries of the Western hemisphere. Both true possums and opossums are marsupials who have been around for millions of year, but that is where the similarities end. Opossums have been roaming the earth for over 70 million years. In fact, they are one of the few species still in existence that lived with dinosaurs. Opossum babies are in the womb for less than two weeks. After that short gestation period, the tiny newborns find their way to their mothers' pouches, where they will begin to nurse and continue to develop and grow. Opossums are able to use their prehensile tails and opposable thumbs on their back legs to grasp branches. They also use their tails to carry food or nesting materials. Opossums have 50 sharp teeth, which is more than any other mammal in North America. Opossums have coarse outer coats that function much like raincoats and softer undercoats to keep them warm in the winter, as they do not hibernate. In many states, it is illegal to have an opossum as a pet without a rehabilitation license. Be sure to check your local ordinances before adding an opossum to your family. Opossums are nocturnal. They need a lot of exercise at night, or they will quickly become obese or stir crazy. They have long, sharp claws and so need appropriate means of filing their nails naturally, or need to have them clipped regularly. Opossums need a wide variety of foods to stay healthy, including fresh fruits and vegetables, cooked lean meats, boiled eggs, and small insects such as crickets. While opossums can be trained to tolerate humans or even to enjoy their company, they are still wild animals and may be unpredictable. Before taking on an opossum as a pet, be sure you have access to a qualified vet. Many veterinarians have no experience with wild animals and may not accept opossums as clients. 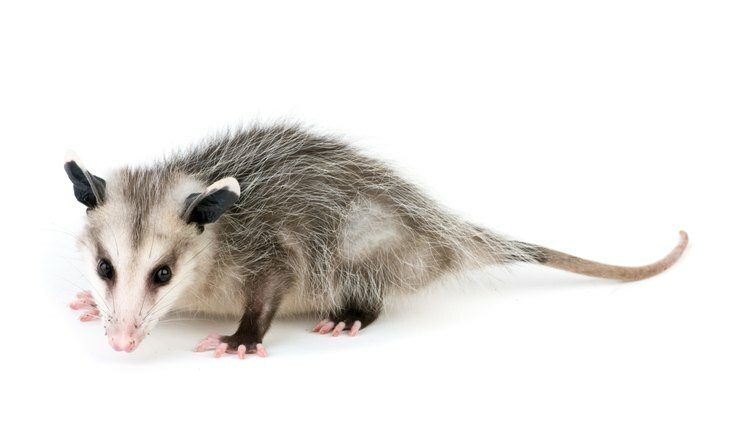 Opossums are susceptible to a wide variety of illness and diseases, so it is critical for the health of your new pet that you have a vet who will see your opossum on a regular basis. Even with appropriate vet care, opossums do not have long life spans, usually living less than four years.